STAY MORE ACTIVE FEEL MORE ENERGETIC. BE MORE PRODUCTIVE. 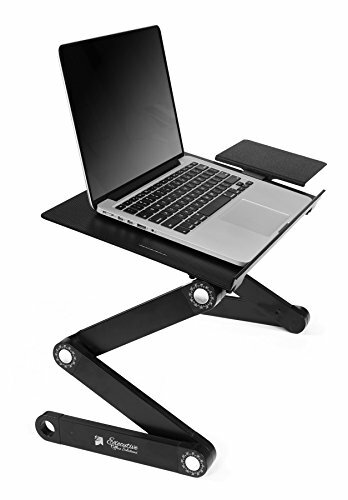 A portable lightweight tray for your laptop, designed for executives on the go and health conscious executives that want to combat standard seated desks. 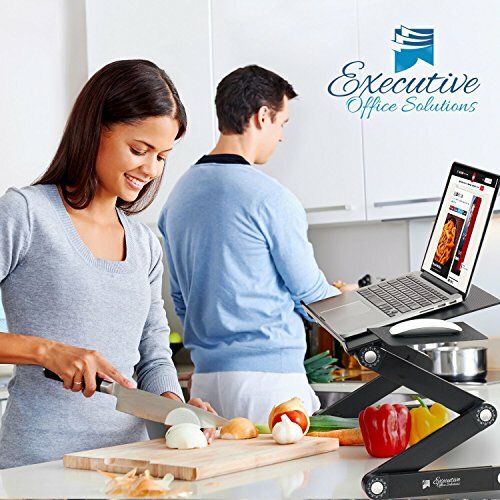 With a lightweight aluminum tray, fully adjustable legs, multi-function design, silent USB powered CPU cooling fans, this ergonomic portable desk makes carrying easy and holds your computer at almost any angle or position. The height adjusts from flat to 20 inches based on the tray’s tilt. Height can be adjusted in two-inch increments. For use in the home or office, the desk will help you to feel more comfortable either in sitting or standing position, to enable you to complete your computer work with ease whilst supporting your general health, productivity and energy levels whilst working, to avoid the “3 O’clock slump”, to gain the boost you need to take care of business. Easy to operate and adjust. Great quality for low cost! A stopper or additional mouse pad for your mouse may be required. Take a stand and boost work performance today!